Attention all fashion bloggers and publishers in design related industries – This is Rich Chique. A dramatic improvement of the most important aspects of RichWP WordPress theme design. Minimal, yet bold. Bloat free, yet flexible. Fast, non-intrusive and easy to work with on a daily basis. Download the full FREE version of this theme and see for yourself (credit link in footer, no support). You can display your latest articles on the front page or use the widget-based front page builder to create a more comprehensive static landing page. This front-page builder only uses native WordPress functions and leaves a minimal footprint in order to retain a fast performing site. Rich Chique is also fully WooCommerce compatible, so feel free to run a shop to sell your own or third party products. Installing the Rich Chique Theme is as easy as it gets. Check the Installation & Setup Guide no need to break into a sweat. 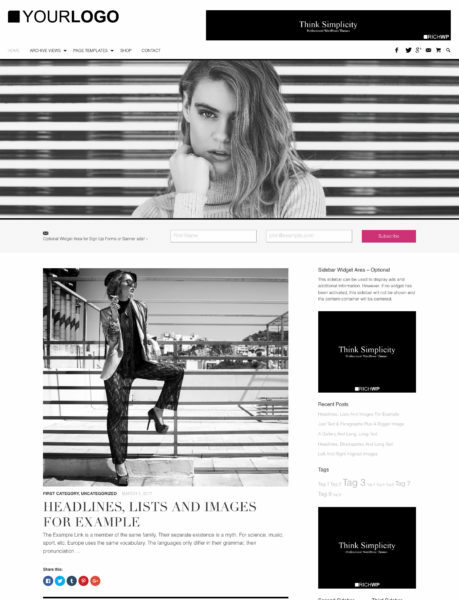 Get your site elevated with the Rich Chique Theme today. Your success will be accelerated. It′s your turn to make headway!